Protect the top of your square sign posts from being smashed up and destroyed by using this drive cap. Easy inexpensive way to install one or more square sign posts without digging. Fits any 2" square post. Size/in. 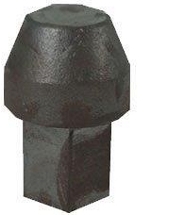 Appx 3" x 4"
Iron drive cap speeds up your installation time tremendously. Simply slip the cap into the top of any 2" square sign post and drive it into the ground with a sledge hammer. For use with 2" square posts only.